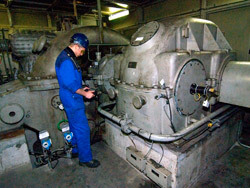 Two steam turbine generator machine train at a large waste incineration station are both equipped with a protection system comprising various displacement probes and accelerometers. In order to gain an up-to-date picture of the real condition, the turbines are monitored, together with the rest of the factory, in a 3 monthly condition monitoring program. On top of the periodical measurements the coast down of the turbine, gearbox and generator is measured every year during the scheduled outage. For the measurement of the coast down, our 32-channel measurement system is connected to the turbine protection system. All transient sensor signals are then simultaneously recorded, enabling a detailed analysis of the various events as the reduction of the power and the coast down of the turbine. 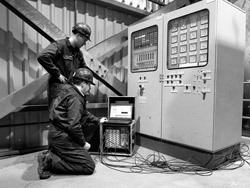 The measurement and analysis of such events is essential for a complete monitoring program. Changes in the vibration behaviour during transients can be an important indication for along striding problems. Problems which can only be detected by comparing these events with history data. History data is besides it also often indispensible for trouble shooting sudden high vibrations or a machinery trip. This unique approach of Van Geffen VMS, has proven itself many times already as quick, cost-efficient and reliable. 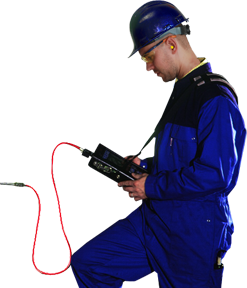 We are increasingly applying this approach for the periodic monitoring of critical machinery in the chemical, power, oil and gas industry, as well onshore as offshore.